Not to be harsh, but you just won’t keep your head above water if you’re after quantity not quality of sales. Not to mention, you’re going to lose motivation; how long would you work for an employer who didn’t pay you for the hours you put in? Not long, so give yourself the same respect and pay yourself properly. You’ve done the calculations and determined that charging the prices you charge will cover your materials and time, AND give you a profit. If you lower that price, you’re eating into your profit and if you don’t make a decent profit, you can’t sustain your business. Quality, well made, attention to detail and long lasting are descriptions often given to items that are handmade. Slapping a low price tag on something you’ve put your blood, sweat and tears into can leave the complete opposite impression with buyers. Think about when you’re out shopping, no matter how beautiful a piece may be, if you see a low price tag, you can’t help but think there must be something wrong with it or that other people don’t want it…which can quickly talk you out of a purchase. You definitely don’t want buyers thinking that your handmade products are made with low quality materials, have poor craftsmanship, a poor fit or defects. If you come on the scene charging low prices, as mentioned above, you may give the impression of low quality. You’ll have a hard time convincing shoppers who have seen you at previous markets, or bought from you before, that your items are now worth the higher prices when you do decide to increase them. Especially if they’re not noticing any difference in the products themselves. I’m sure you’ve heard that it’s cheaper to sell to an existing customer than acquire a new one. With that in mind, you want to be attracting the right customer from the start; ones who value your work and aren’t just looking for a good deal. Handmade is NOT about getting a deal. You’ve put a lot of hard work into your products and you want your customers to understand that. You set the tone with your prices and if customers come to know you for lower prices, that’s what they’ll continually expect. “Lowest Prices” is a hard business model to sustain when it comes to selling handmade. Keeping in mind that you can’t underpay yourself forever, you’re going to eventually have to raise your prices. You’ve done all this work to attract customers…but they expect low prices. So guess what will happen when you raise them? Chances are, they won’t stick around and you’ll be back at square one, building a new customer base from scratch. If you’re selling handmade slippers and have calculated your prices out to $40/pair, other vendors probably have similar prices. But if you decide you could sell more at $20 and lower your price, that then sends a message to shoppers. They’ll now scoff at the other vendor’s properly priced slippers and believe that $20 is an appropriate price. Have some faith in yourself and your work! You may not believe that your thoughts have an effect on your success but they do. There are many studies backing up the fact that positive thoughts help your brain become more engaged, creative, motivated, energetic, resilient, and productive at work. (Don’t believe me? You should read Shawn Achor’s The Happiness Advantage) If you’re starting your business off thinking that you or your products aren’t good enough to charge these prices, you’re putting yourself at a disadvantage. Believe in what you’re doing; it will come through in your attitude, your business and your products. 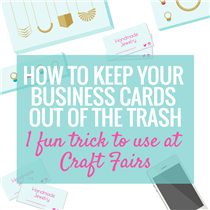 If you plan to sell your products outside of craft shows and your website/social media platforms, you’ll probably venture into selling wholesale. 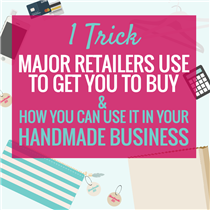 As you’ll find in our article on pricing your handmade goods properly, once you add up your time and materials, you need to multiply it by 2 to get your wholesale price. This ensures that you’re still making a profit when you sell your products at a wholesale price (the price retailers pay to carry them in their store). Once you have your wholesale price, you multiply that by 2 to get your retail price. This is the price you and retailers will sell your products at to ensure retailers also make a profit. 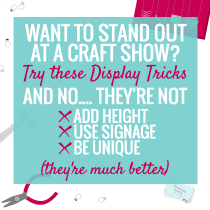 If you start lowering that retail price, you may still make a nice profit when you’re selling on your own at craft shows, but retailers will still expect your wholesale price to be at least 1/2 of your retail price. And no, you can’t have a lower price at craft sales than your retailers are selling your products at. That’s not fair to them and you’ll eventually burn your business bridges. Think about it; if you’ve followed the proper pricing formula and your handmade slippers should be $40, that means that if you’re selling them at a craft sale, *approximately $30 is profit (*we have to remember the expenses associated with the craft sale that take away from our profits; table fees, parking, time, etc). If you’ve decided that you’ll make more sales pricing them at $20, you’re making approximately $10 profit per sale. That means you have to make 3 sales at $20 instead of 1 at $40. Not only is it harder to turn 3 shoppers (instead of 1) into customers, you’ve also used 3 times more materials and time to make that profit. 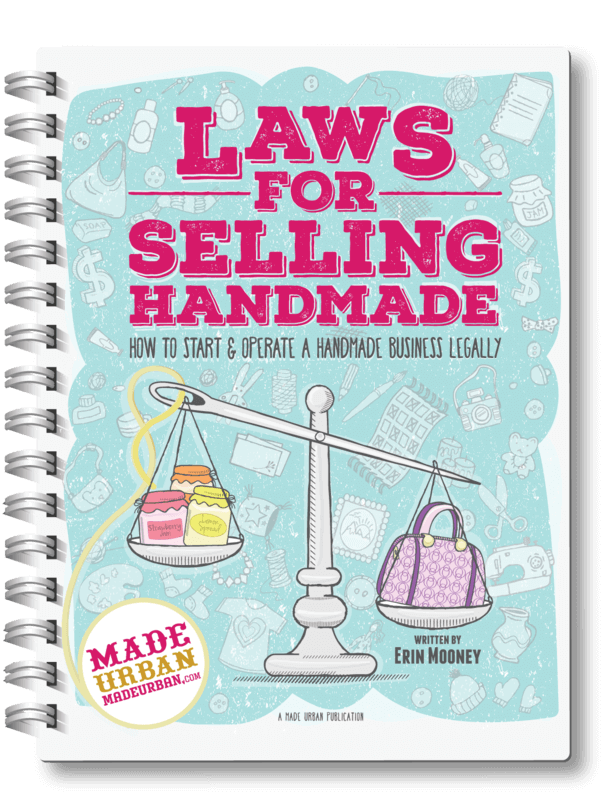 It can be tempting to lower your prices in an attempt to get more sales but the people who shop handmade aren’t looking for a cheap deal, they’re looking for value. Just because they have $5 in their pocket doesn’t mean that they’re willing to spend it on anything. They want items that feel unique to them, have a story behind them and make them feel like they’re making a difference with where they spend their money. Don’t you cherish the items you have to save up for, just a little more? Or take a little extra care of them and become a little more proud? Most people shop handmade to find pieces that they, or the person who receives it, will cherish. It cheapens the overall experience when you cut corners on all the little things that make handmade great. The fun packaging & displays, your branding, the catchy names, the hand written tags, your thoughtful wrapping or your appreciation for each sale (how long can you keep that up when you know you’re barely making a profit from that sale?). Put thought and effort into these areas and show the shopper why your products are worth their prices.